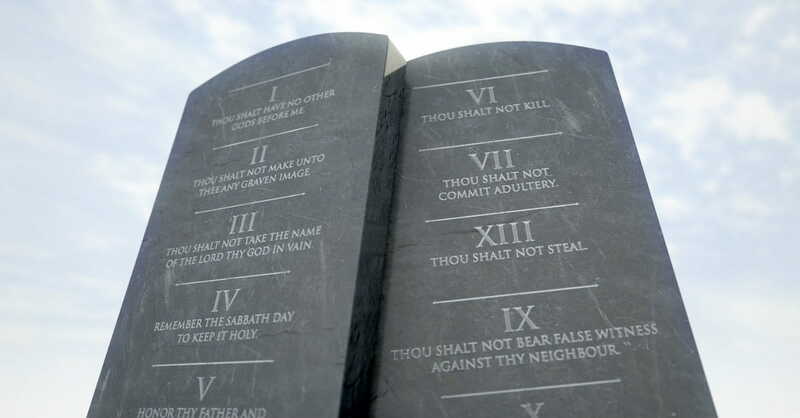 I suppose for many, the only exposure to the 10 Commandments has come from movies and television shows. I was surprised to find that there have been at least seven motion pictures produced since 1923—the first being a silent film. Gone are the days of the classic Charlton Heston version. Now, there are documentaries, animations, online videos, and mini-series’ of the infamous story. The biblical account of the 10 Commandments, however, paints a much deeper picture of the miraculous events surrounding Moses and the Israelites in the wilderness of Sinai. The books of Exodus, Leviticus, and Numbers record, in detail, the 11-month period that the Hebrew nation camped at the foot of the mountain and were tested by God. If you’ve never done an in-depth study of these Old Testament books, I encourage you to take some time to study them closely. I was blessed to discover some interesting things I didn’t know before. Here are 10 things you might not know about the 10 Commandments. 1. They were spoken to Moses three months after he led the Israelites out of Egypt. God’s timing in waiting until the third month to give the commandments was no coincidence. He had already proven Himself as their Deliverer and Provider and it was time to test their faith and reveal His divine standards for them. The third month also parallels the New Testament Pentecost, when the Holy Spirit came upon the first church in Acts 2. The Israelites were God’s chosen people, and by setting forth His commandments, He was declaring an everlasting covenant with them that would later be fulfilled in Jesus’ life, death, and resurrection. 2. The commandments were written by God, not Moses. There have been skeptics who claim that Moses copied the commandments from an ancient Babylonian text called the Code of Hammurabi. While Hammurabi did record 282 civil and criminal laws, 300 years before Moses, any similarities between the two sets have remained just that—similarities. Hammurabi’s laws were based on civil actions and harsh punishments. The 10 Commandments were based on God’s deep and unconditional love for His people. 3. There were actually two sets of stone tablets. Because Moses remained on Mt. Sinai for such a long period of time, the Israelites figured he wasn’t coming back down and decided to make an idol in the form of a golden calf. When Moses saw it, he threw the first tablets down the mountain in anger. After that, the Lord called Moses to chisel a new set of stone tablets and once again trek up the mountain for divine revelation. This time, Moses fasted 40 days and 40 nights, listening to the voice of the Lord as He spoke the words of the covenant law a second time. 4. The commandments were placed in the Ark of the Covenant. I have a plaque of the 10 Commandments hanging on my wall that was made to look like ancient stone. My husband and I bought it on our tenth wedding anniversary, as a reminder of God’s faithfulness to our family. I plan to keep the memento and pass it down to my children and grandchildren as an heirloom of faith. But the real stone commandments, according to Exodus 40:20, were placed by Moses into the Ark of the Covenant. Also known as the Ark of the Testimony, it was a chest made from acacia wood, overlaid with gold, and used to hold the rod of Aaron and a portion of Manna as well. 5. Commandment number five is followed by a direct blessing. This is the fifth commandment found in Exodus 20, and it is also the one commandment that is followed by a blessing. It is worth noting that God’s gift of long life is much more than a lengthy number of days. It is a promise of His provision, protection, and guidance every day of our lives. Honoring our parents was included in the 10 Commandments because God ultimately wanted His people to honor Him. Treating our earthly parents with due respect is just a hint of how we honor and glorify God. Even when relationships are fragmented and parents seem unworthy to receive honor, there is great blessing when we choose to obey the fifth commandment. God knows. He understands. And He is faithful in keeping His promises. 6. All 10 commandments are upheld in the New Testament. As I brainstormed points for this article, I admit that I didn’t know for sure if this fact was true. I hoped it was, but I couldn’t automatically recall whether or not every one of the 10 Commandments were mentioned in the New Testament. 7. It's easy to break the third commandment without realizing it. Simply Google the term “OMG,” and half a dozen dictionaries pop up with a whole slew of definitions. However, the bottom line is, it is saying “Oh my God.” Most of us have been desensitized toward phrases like this because we see them every day on social media. But referring to God’s name in any way that does not show deep respect and honor, is taking His name in vain. If God’s enemies take His name in vain, we, as Christians, should be careful to set ourselves apart by refusing to refer to Him in any way other than reverence and praise. 8. We are to write the commandments on our hearts. I remember way back in the 80s, when I first became a Christian. Our college group memorized Psalm 119:11. “I have hidden Your word in my heart that I might not sin against You.” Years later, I passed that verse down to my kids, reciting it in the car and taping it to the bathroom mirror. 9. The number 10 signifies "completeness" in the Bible. Without trying to find any “hidden meaning” in the Bible, we can see that God’s intent in writing 10 commandments, on tablets of stone, was to give His people a law of completeness. Though dozens more ceremonial laws were given to them as well, the 10 commandments were foundational in the covenant between God and man. 10. The early patriarchs didn't have the 10 Commandments. It had never crossed my mind, before writing this article, that the patriarchs before Moses didn’t actually have the 10 Commandments in their midst. However, we know that God spoke to each of them on multiple occasions, made covenants with them, and gave them specific commands to follow. So, even though the patriarchs before Moses didn’t have the actual 10 commandments written in stone, they each had a relationship with God and walked by faith according to His commands. And in their obedience of faith, they were considered righteous (Hebrews 11).